Whether you choose a black leather jacket or a diplomatic-grey suit, you’ll look equally smart aboard the black MP3 500 Sport. It’s a creature that suits all and none and everybody in between. The Piaggio MP3 is a do-it-all vehicle with enough motor to go as far as you like just as easy as it would pop down to the shops for a couple of quarts of milk or a bottle of red wine. Under the seat is a massive 50 litre (13.2 gal.) storage compartment that’ll hold two full-face helmets or three days worth of groceries. The compartment is even lit for convenient night time access. Riding over the cobalt streets Napoleon’s men laid a couple hundred years ago, the MP3 makes a lot of sense. This stuff isn’t exactly grippy on a dry day so that extra wheel at the front is great, particularly at full lean. The suspension on the front wheels work independently of each other and you have twice the rubber touching the tarmac compared to a conventionally forked scooter or motorcycle. This alone provides a lot of extra confidence – even for a “proper biker,” like me. Piaggio has now added both ABS and ASR (Acceleration Slip Regulation, or, traction control), to its flagship GT scooter. The ECU compares the rear wheel speed to each front wheel independent of one another, meaning that, if you brake and hit a banana peel with one of the front wheels, the ABS will react to only the wheel atop the banana peel, while braking at maximum power with the other wheel. As for the ASR, this, naturally, only works in one place, and that’s the rear wheel, by reducing torque should it spin up while accelerating. I enjoy every second of riding time in Paris. We circulate that 10,000 ton tower that the creator of the Statue of Liberty put together in his spare time 125 years ago. The MP3’s new dashboard features a large central digital readout surrounded by two analogue clocks. The Business version receives a more classy car-like design with brown details. It’s all pleasing to the eye and easy to operate. Strangely, a not-so-pretty white cable connects an iPhone to the vehicle. 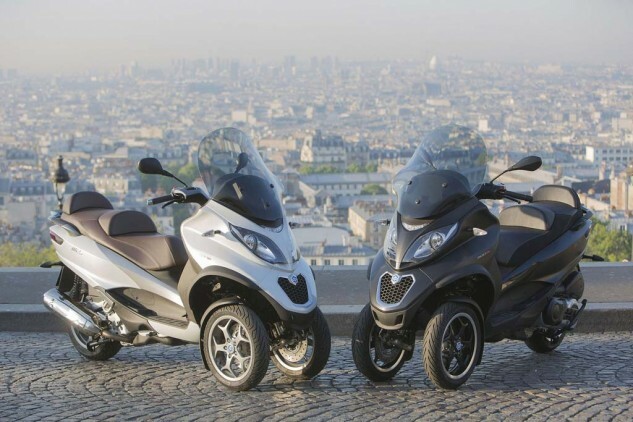 The PMP (Piaggio Media Platform) gives a vast amount of additional technical information. 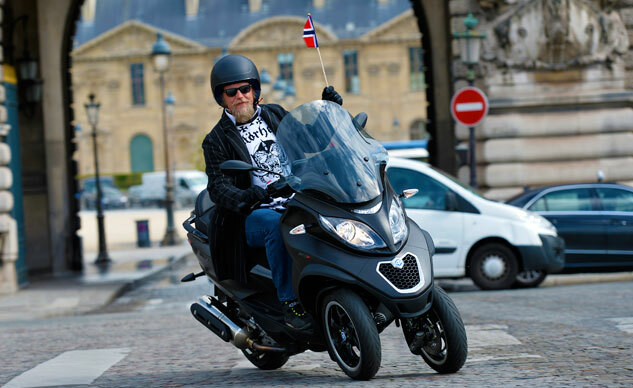 The MP3 can be ridden with a car license in European countries as it is classed as a trike and features a brake pedal and parking brake. The brake pedal combines both the front and rear brake discs and gives superb stopping power each time. The doubling of the rubber up front and new 258mm brake discs (with their ABS) in addition to the forward weight bias makes for superb front end braking power. I almost feel as if it’s in league with superbike-on-slicks braking performance. This is top notch! Stopped at red lights, I switch on the roll lock, put on the hand brake, and take a nap until the car horn behind me wakes me up. Most of the time, I’m in awe of the engineering and high tech solutions the MP3 represents. If you don’t use the parking brake, you just have to roll the throttle to get started straight away when the lights go green. The smooth automatic transmission shoots you forward faster than most cars despite its meager 40 horsepower. The large single cylinder four stroke has been improved for better torque response at low rpm in addition to better fuel economy. 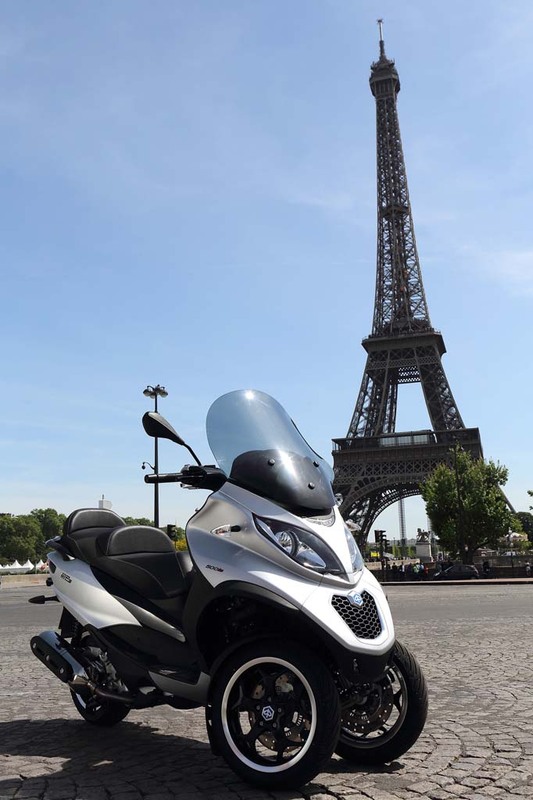 Using it in ECO mode reduces fuel consumption by 10%, according to Piaggio. There are some vibrations at idle, but the MP3 moves along with great smoothness as soon as we are rolling. The new muffler provides “better” sound while being even quieter than before. The automatic transmission is great and gives instant acceleration for moving around the city. Moving to the motorways, the MP3 stretches its long legs. Rider and passenger can enjoy countless miles together on this three legged frog-unicorn. If you’re looking for the pillion pegs, these are now retractable for a sleeker design. I can envision Piaggio giving the MP3 an even fresher and more powerful engine in the future, but it’s more than enjoyable as is. The MP3’s handling is very motorcycle-like. The front is definitely heavier, but the MP3 falls into the corners beautifully at speed. The limit is really easy to find – mostly because it’s so safe to find it! The MP3’s quirkiness for both bikers and car drivers comes from the sensation you get when you open the throttle and the roll lock disengages, transforming the MP3 from a stiff old stationary thing and into a living breathing vehicle. The sensation can be described as having a magical car that suddenly starts leaning when you touch the steering wheel. 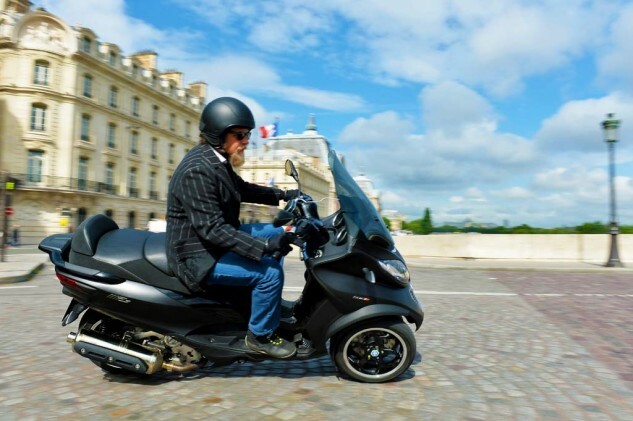 Once you get used to it (which takes just three seconds, trust me), it’s one of the great perks about the big Piaggio. Any insecurities in motorcycle riding, like not trusting the front wheel on a wet road, simply vanish when riding the MP3. If you’re after a lazy, forgiving ride but feel claustrophobic in a car, then the MP3 is all the freedom you need and possibly the greatest compromise between the safety of a car and the freedom of a motorcycle. I’d even recommend the MP3 to motorcycle commuters because it takes away the stress of riding on a damp morning. 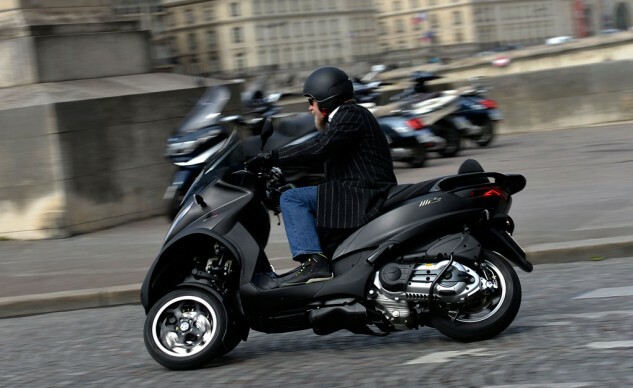 Sell the car and keep the motorcycle for joy riding then use an MP3 for commuting. If you have to have a car then do as the French and use the MP3 as the second car.